WASHINGTON, Jul 24 2013 (IPS) - A U.S. federal judge has upheld a key regulatory provision aimed at ensuring that the profits from products mined in central Africa are not used to benefit armed groups, particularly in the Democratic Republic of Congo (DRC). 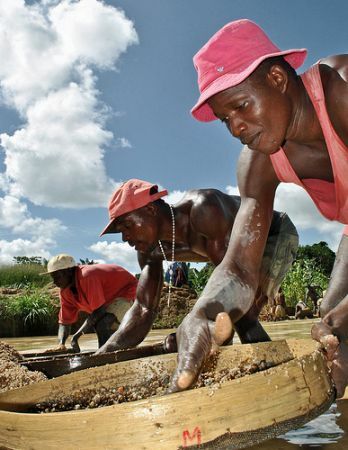 Rights groups are lauding the decision, stating that the so-called “conflict minerals” provision has already led to positive impacts on the ground, both in Congo and in U.S. boardrooms. “This is a major victory, and shows how important this rule is for holding companies to account and ensuring that they take responsibility for the impacts of their purchases,” Corinna Gilfillan, head of the U.S. office of Global Witness, a watchdog group that filed a court brief in the case, told IPS. The rule, known as Section 1502 or the “conflict minerals” provision, was originally signed into law in 2010 as part of a massive piece of financial industry legislation known as the Dodd-Frank Act. Two years later, in August last year, U.S. regulators finalised details on how companies listed in the United States would be required to implement the provision. Under Section 1502, starting in early 2013 companies using any of four minerals – gold, tin, tungsten or tantalum, widely used in modern electronics – sourced from the DRC or neighbouring countries would need to provide proof that they had carried out due diligence to ensure that these products were not benefiting armed groups. Yet the rule immediately faced a lawsuit by powerful trade associations representing U.S. businesses and manufacturers. They claimed that the conflict minerals provision would impose inordinate costs that U.S. regulators had not fully analysed, among several other complaints. Another Dodd-Frank provision, requiring large extractives companies to disclose any payments made to foreign governments, was struck down by the U.S. courts earlier this month. On Tuesday, however, Judge Robert Wilkins rejected each of these contentions, finding the Security & Exchange Commission (SEC)’s economic analysis to have been “eminently appropriate”. “Taking all of these elements of the disclosure scheme together, the Court finds a ‘reasonable fit’ between the relevant provisions of Section 1502 and the Final Rule and Congress’s objectives in promoting peace and security in and around the DRC,” Judge Wilkins wrote in a detailed 63-page opinion. For now, Tuesday’s fairly resounding decision clears the way for full implementation of Section 1502, with no other lawsuits on the issue currently pending. Yet despite the legal uncertainty, this rule has already led to significant action from the Congolese government as well as several major U.S. companies – including those technically party to the lawsuit. Other major electronics companies to break with the Chamber on this issue in recent months have included Microsoft and Motorola. International industry initiatives – such as the Conflict Free Smelter Programme – have likewise been started or strengthened in the aftermath of Section 1502’s passage. In addition, the Congolese government has sought to build on the groundwork laid by Section 1502. In late 2011, the country’s mining minister reportedly stated that the legislation offered a “major opportunity” to delink minerals and violence in Congo, which has been at the centre of natural resources-driven conflict for more than a century. Last year, the Congolese government introduced legislation requiring companies using these minerals to undertake supply chain due diligence to ensure that the products weren’t funding rights violations. Since then, the government has suspended at least two Chinese export companies for failing to adhere to this process. Dodd-Frank is also catalysing broader global action on conflict minerals, with the European Union in particular currently considering adopting policies similar to Section 1502. A public consultation process on this proposal just closed, and some are expecting draft legislation by the end of this year. But while the United States may be leading global policy in this particular area, some groups are frustrated that Washington has yet to implement nascent international guidance on the human rights-related responsibilities borne by multinational corporations. On Wednesday, a dozen rights, development and environment groups, under the umbrella of the International Corporate Accountability Roundtable (ICAR), sent a letter to President Barack Obama, calling on him to prioritise implementation of the United Nations Guiding Principles for Business and Human Rights, passed in 2011. During a fact-finding mission to the United States, the letter notes, a U.N. working group found “significant gaps” in the U.S. efforts to implement the Guiding Principles, as well as “little appreciation of human rights being material to the conduct of business”. Tuesday’s court decision on Section 1502 “recognises that business has a responsibility to respect human rights, and that the government, including agencies like the SEC, can and should ensure that business operations do not negatively impact human rights,” Amol Mehra, director of the Washington-based ICAR, told IPS.